Aretha Franklin, the preacher’s daughter whose powerful voice made her the long-reigning ‘Queen of Soul’ with such hit songs as ‘Respect’ and ‘Chain of Fools,’ died on Thursday at the age of 76, officials said. Franklin, who won 18 Grammys and had some 25 gold records, died at her home in Detroit surrounded by family and loved ones, according to her publicist. She had been battling advanced pancreatic cancer, and her relatives had asked for prayers. “Throughout her extraordinary life and career, she earned the love – and yes, the respect – of millions of people, not just for herself and for women everywhere, but for the city she loved so dearly and called home,” Mr. Duggan said in a statement. Franklin’s father was a Baptist preacher in Detroit, and the gospel singing she heard in his church was her musical foundation. She created a uniquely emotional and powerful voice that put her at the forefront of 1960s soul music along with Otis Redding, Sam Cooke and Wilson Pickett. 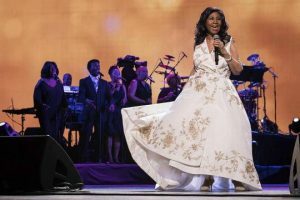 But when she switched to Atlantic Records in the mid-1960s, producer Jerry Wexler knew just what to do with Franklin, putting her powerful voice in a setting that combined gospel, soul and rock and made her a superstar by letting “the lady wail.” As Franklin put it in her autobiography, she ‘Aretha-ized’ the music. In a statement, former President Bill Clinton and former Secretary of State Hillary Clinton, said Franklin was one of America’s greatest national treasures. Franklin’s heyday extended into the early 1970s as she dominated the music charts with ‘I Never Loved a Man (The Way I Love You),’ ‘Baby, I Love You,’ ‘Chain of Fools,’ ‘Think,’ ‘(You Make Me Feel Like) A Natural Woman’, ‘Do-Right Woman’ and ‘Respect’, a cover of a Redding tune that became a song of empowerment during the civil rights era. 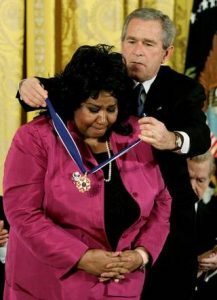 Franklin’s popularity would fade but she had a revival in the mid-1980s with songs such as ‘Freeway of Love’, a duet with George Michael named ‘I Knew You Were Waiting (For Me)’, ‘Sisters Are Doin’ It for Themselves’, ‘Who’s Zoomin’ Who?’ and a cover of the Rolling Stones’ ‘Jumpin’ Jack Flash’. Franklin often demanded she be paid in cash before performing and took her status as musical royalty seriously. In 2008 Beyonce introduced Tina Turner as “the queen” at the Grammy Awards ceremony, which Franklin decried as “a cheap shot” at her. Franklin was born March 25, 1942, in Memphis, Tennessee, and raised in Detroit. Her father, the Rev. C.L. Franklin, was respected as a civil rights leader, an early advocate of “black pride” and a friend of King. The Reverend Franklin was a charismatic figure but had also been arrested for drug possession and, under unexplained circumstances, his wife left him and their five children when Aretha was six. Four years later, Franklin’s mother died and Aretha avoided discussing her parents publicly. Franklin started touring as part of her father’s gospel show as a teenager and got a musical education from gospel greats of the time – the Staple Singers, the Soul Stirrers, James Cleveland and The Mighty Clouds of Joy. In February 2017, she said she would keep recording but retire from touring after a limited run of concerts marking a new album that year, ‘A Brand New Me’, which featured her doing some of her biggest hits with the Royal Philharmonic Orchestra. She performed ‘Natural Woman’ at the Kennedy Center Honors in December 2015 in a tribute to songwriter Carole King, who wrote the song. Her last live performance was Nov. 7, 2017, for the Elton John AIDS Foundation gala.